Is your audience strategy informed by the right metrics? Whatever your audience strategy, it is likely designed to grow audience across platforms, optimize revenue opportunities and build customer intelligence that can be leveraged into advertising revenue growth. This is the subject of much discussion and debate, but one dimension of strategy that is universal is time. A true strategy cannot achieve the ambitious objectives discussed above in the short-term. A strategy is essentially a plan to bring about a desired future and, therefore, requires a long-term, sustained focus. So why do so many audience marketers look at a short-term metric like cost per order (CPO) to determine whether or not their audience strategy is working? Not only does cost per order not tell the full story, it can be entirely misleading. To put it another way, you cannot measure the effectiveness of a strategy that is designed to maximize future value with a metric that is only relevant to the here and now. CPO is appealing because it is easily measured using a calculator – you simply divide the total amount of spend by the number of starts generated – numbers that are at the fingertips of most audience marketers. But it cannot account for the quality, tenure or lifetime value of those starts. Thus, CPO does not measure the effectiveness of your audience strategy. Cost per unit (CPU), on the other hand, measures the true contribution of a start. CPU considers not only the cost to establish a new customer relationship (acquisition), but also the duration of that relationship (maintenance). In other words, customer value is an integral component of the CPU calculation. An even more problematic metric used to assess sales performance is simply the volume of starts. This suffers from the same problem as CPO – there is no customer value attributed to those starts when viewed as equivalent valued units. But a particularly useful and relevant metric can be constructed using start/stop data. This is simply the trend in starts minus permanent stops over time. 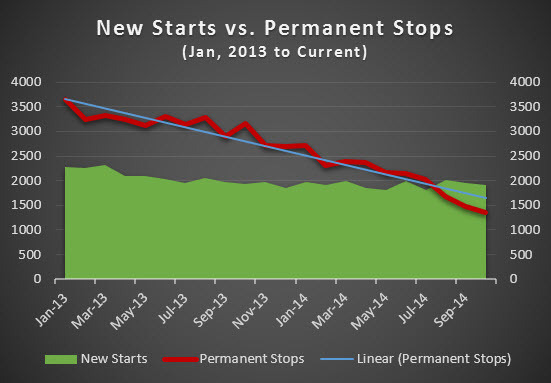 For many, "starts minus permanent stops" is a very negative number. But the trend in that number over time indeed offers insight as to whether or not your audience strategy is making an impact. That is, if the deterioration is slowing – even if the total volume of starts is declining – your strategic initiatives are likely taking hold. That is because the focus on quality, sustainable customer relationships – rather than just on the volume – is positively influencing your numbers. In summary, long-term customer value and the return on marketing investments will be optimized when the right offer is delivered to the right consumer at the right time via the right channel. Useful metrics in assessing the impact of your marketing initiatives on your audience strategy include cost per unit and the trend in starts minus permanent stops over time (at least 12 months). Tom Ratkovich is managing partner of Leap Media Solutions. He can be reached at (303) 886-0202 or tom.ratkovich@leapmediasolutions.com.